The Hyundai Sonata is packed with a lot of great new interior features. It’s no surprise that it’s a popular midsize car in Cottonwood. We’ll talk to you about the features, including the infotainment, the safety, and the amount of space inside. The Sonata offers a 7-inch touch-screen display that connects you to the infotainment system. You can enjoy a user-friendly experience with Bluetooth, voice commands, and more. You will have a six-speaker sound system and can connect your smartphone to access music and music streaming apps. Five fit comfortably inside of the sedan. 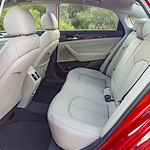 Cloth upholstery is the standard, though you can also get leather upholstery, heated and ventilated seats, and power-adjustable front seats. Plenty of cargo space exists, especially with a trunk that is larger than others in its class. Seats fold down, too, so you have as much room as you need for larger items you need to haul.